The S&P500 finished modestly lower on the first day back from the Christmas holiday. No real news to speak of and we should expect more of the same as we finish off 2017. Now that Tax Reform is law, there isn’t much for traders to talk about or look forward to. And without big ideas to latch onto, the market has been treading water these last few weeks. Unfortunately for bulls the window for a Tax Reform pop has already closed. If it was going to happen, it would have happened by now. Gains over the last several months priced in tax cuts and there was no one left to buy the news. Now that Tax Reform is old news, we need turn our gaze to what comes next. 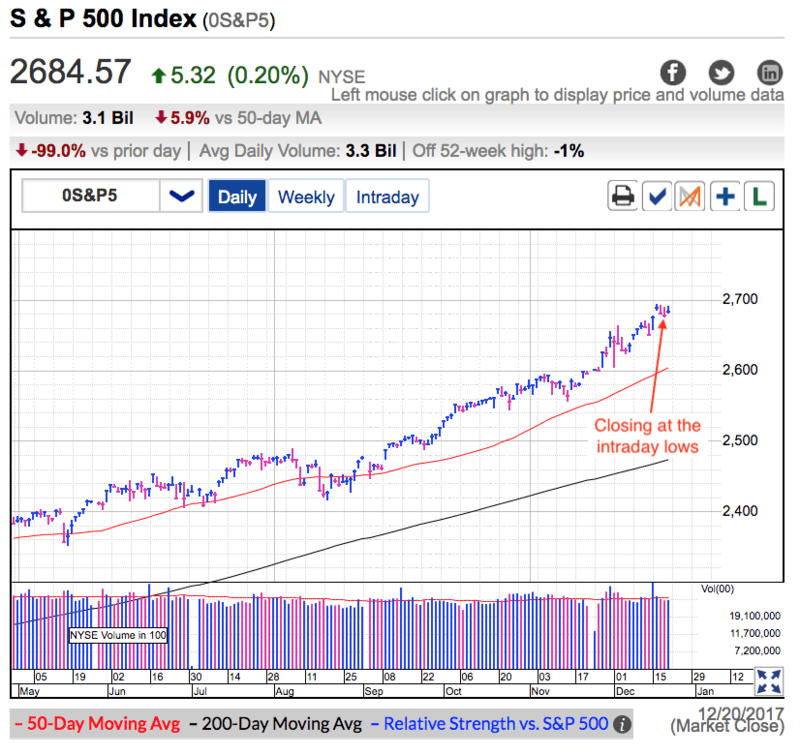 Strong earnings reports next month could extend this rally, while any bad news could trigger a dip back to 2,600. High probability of small gains versus a low probability of bigger losses. The problem for bulls is everything needs to go right to beat these already lofty expectations. Bears only need one thing to go wrong. Perfection versus the messiness that is the real world. Markets move in waves and it’s been a while since we cooled off. I don’t know what will trigger the next dip, but I do know it is coming. The only question is when. Most likely momentum will keep us drifting higher over the near-term, but it is only time before the next problem crops up and we fall into a long overdue dip and consolidation. 2017 was a great year for stocks, but unfortunately the rarest thing is for two years to be exactly the same. If 2017 was a gentile ride higher, that tells us 2018 will be anything but easy. No don’t get me wrong, I’m not bearish. I just expect the market to consolidate recent gains and that means we will have to work for our profits in 2018. 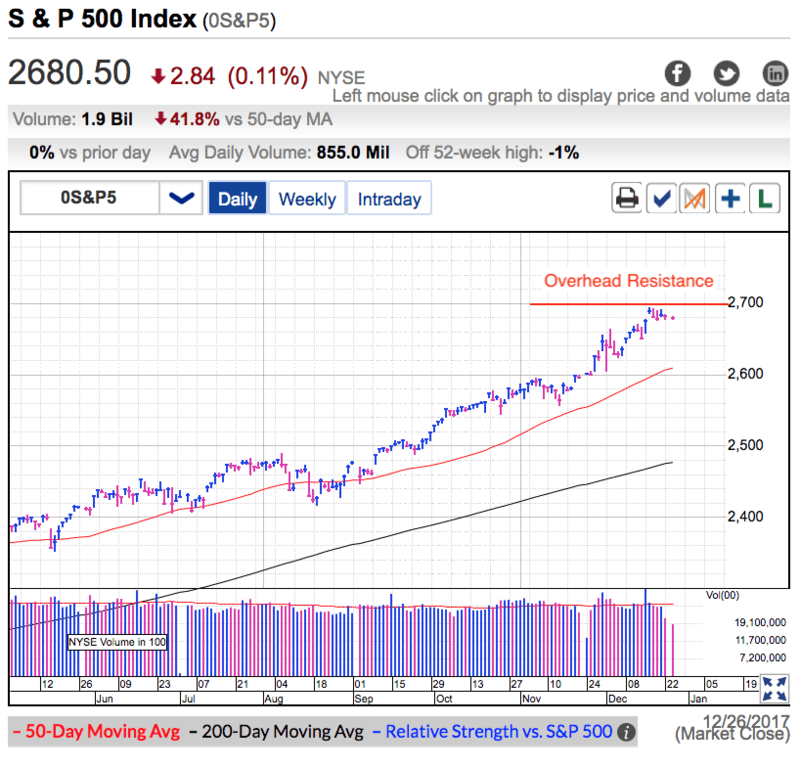 Thursday was another indecisive session for the S&P500 as early gains fizzled into the close. This was the fourth day in a row stocks finished at the lower end of the intraday range. Under normal circumstances weak closes are a concern, but these are anything but normal times. On Wednesday Republicans cleared the last major hurdle on the way to Tax Reform. The revised tax bill sailed through Congress and is now waiting for Trump’s signature. There is some discussion on if that will happen this month or early next month, but the day doesn’t matter much since the cuts take effect January 1st regardless. These were the tax cuts everyone has been waiting and hoping for since Trump won the election over a year ago. And what did the market do when Republicans cleared the last hurdle? It gave up early gains and finished ever so slightly in the red. Quite the underwhelming performance given how significant this Tax Reform package is. But that is how the market works. It is always looking ahead and this tax bill was already old news. The other complication is we are quickly approaching the Christmas and New Year’s holiday dead zone where volumes drop off dramatically. When big money leaves for vacation, it gives smaller and less rational traders control of the market. While volatility might pick up over the next several sessions, small traders run out of money quickly and most of these moves reverse within hours or days. Don’t pay much attention to the price-action when big money isn’t participating. The market is generally feeling optimistic. Stock are near all-time highs and Tax Reform just passed. The weekly AAII sentiment survey reveals bulls out number bears by 25-points, and on Stocktwit’s $SPY stream bullishness was at 72% a few days ago. While nothing says these levels cannot get even more bullish, we are approaching extreme levels and one has to wonder where the next buyer will come from. And that is exactly what happened Wednesday when the market failed to rally following the Tax Reform vote. Everyone who wanted to buy tax cuts had already bought, meaning there was no one left to buy the news. Momentum is definitely higher and anything can happen during this holiday lull, but bulls need to be careful. Markets move in waves and it has been a nice ride to this point. The question is if this wave is running out of steam and we are approaching a normal and healthy consolidation. Few things make me more nervous than a market that cannot go higher on good news. That is the market’s way of telling us it is ready to take a break.